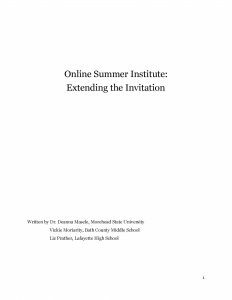 If you are reading this monograph, your site may be thinking about launching an online summer institute, considering ways to offer a hybrid institute or looking to improve your own hybrid offering. We invite you to read our story about how this new wrinkle has become so indispensable to the important work we do. This monograph is not a protocol, but an invitation to peer over the shoulders of our director and the leadership team who developed and refined a vibrant and sustainable online community of writing teachers. We understand your concerns about community because we had those same concerns at the launch. We understand your concerns about the barriers of technology because we tried several different tech platforms before we found just the right house for comfort and utility for our unique context. It is our hope that this monograph will answer both your philosophical and practical questions and support the National Writing Project’s mission to provide new pathways for educators who are connected in their commitment to authentic writing instruction.